A few weeks a reader asked for a post on what makes a tie more or less formal, smart or not. It’s a very relevant question. Few men today wear ties, but when they do, they rarely want them to be as smart as the traditional foulards and Macclesfield weaves. Understanding how to dress down a tie (or, for the right occasion, up) is important. The elements that make a tie more or less formal are very similar to those that affect suits, shoes or handkerchiefs. Brighter colours and bolder patterns are less smart; smooth texture and dark tones are more. Just like a strongly patterned, woollen jacket is less formal than a plain suit in smooth worsted, so a cashmere tie with a big club stripe is less formal than a navy repp. The four dominant elements here are: tone, colour, texture and pattern. Of these, texture is often the most important in a tie – partly because it is the most subtle and easy to miss. 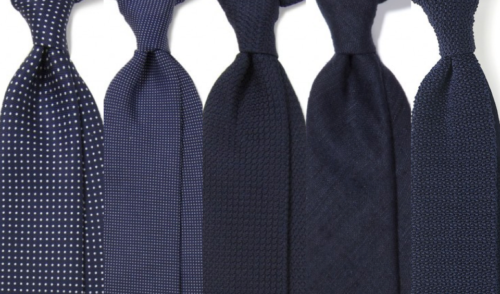 In the image at the top of this post, I have shown five ties that have greater texture from left to right. They are: printed silk, woven silk, grenadine, tussah and knitted silk. All things being even, they would therefore go from more to less formal, left to right. The first two have a pattern, however, which sets them apart, and are slightly different shades of blue. The printed silk (left) has a slightly larger pattern (less formal) but is a darker shade of blue (more formal). The difference between these two is tiny, but the important thing to realise is that all three things – texture, pattern, colour – make a difference as well as texture. You could argue about the list, but it’s essentially an objective judgment of the same thing: how textured, how smooth or not, is the material? This is largely important because it affects the way light is absorbed or reflected. Below is a diagram showing pattern together with the three other elements – tone, colour, texture and pattern – that should be considered. Again, there are things we’re leaving out here, such as finishes on the silk or wool/cotton, but the same principles generally apply. An important point on pattern is that it matters both how big it is, and how fancy. So a club stripe is a large, dominant pattern; but it’s simplicity makes it relatively formal. A paisley, on the other hand, is usually quite informal even at a lower scale. Deciding whether two ties with widely different readings on these scales is largely pointless. Is a (muted) pink tie with a large (but simple) pattern smarter than a (strong) blue tie with a (small) fancy pattern? It doesn’t really matter. The important thing is that if you want to know which tie to wear to a formal event and which informal, you have four elements to consider. A satin tie is often great for an evening event because of its sheen (but is smarter in navy than in yellow). A grenadine, in navy or black, is perhaps the most versatile of all ties because its texture sits in the middle of the spectrum. Reader (I think you were anonymous) I hope that helps. You can follow the discussion on How smart is my tie? by entering your email address in the box below. You will then receive an email every time a new comment is added. These will also contain a link to a page where you can stop the alerts, and remove all of your related data from the site. I think you’ve demonstrated quite well , by the many parameters, the difficulty choosing the right tie can be. I find this particularly diffcult when most of us have for example a Tweed suit but a a collection of ties all brought to match against worsted suits. What about brands like Boglioli , that try to bridge the gap between formal and informal. Is it a case of only a knitted tie ? Which manufacturers do you recommend tie wise? And is there a big difference in quality between the “best” and the more common Duchamp type ones (as perennially seen on tv presenters)? Unfortunately someone decided years ago that it is a good idea to let brides chose a colour and a theme which everyone else has to work with… ! Ah well. Never used to happen back in the day. I have a fairly simple tie collection and tend to wear sport coats most of the time at work. I consider a suit a relatively formal garment and usually choose a relatively formal tie. With sport coats my ties are more patterned (if the coat doesn’t feature a lot of pattern) or a single colour tie in a less formal texture (i.e. knitted) if the sport coat features a strong pattern. Thank you. I have also seen that one. It was originally first choice but when we looked at the colours in the shop it wasn’t quite right (brides eh?) but a bespoke option might actually be the solution. It’s not particularly formal. Very good article; little to argue with. Hi Simon, can you comment on the formality of various tipping styles (self-tipped, untipped, etc.)? I work in a formal business environment, and would assume that untipped ties are more casual. What exactly do you mean by formal? Properly formal daywear – such as a morning suit – generally demands a light coloured tie. See e.g. http://www.thegentlemansjournal.com/the-best-dressed-royals-at-royal-ascot/. Formal evening wear of course demands a bow tie (textured white being the most formal). Plain black ties are worn by gangsters. Nice guide Simon, the four elements is a beautiful way to explain this. 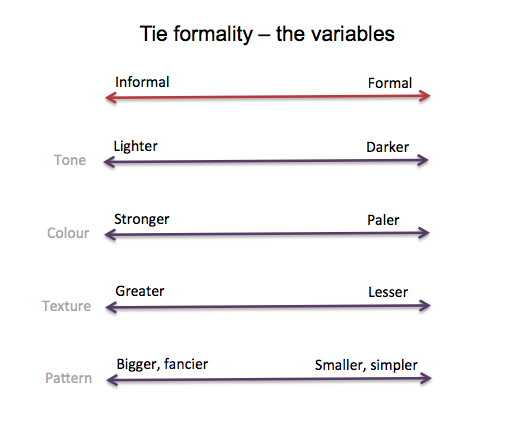 In terms of pattern for a necktie formal to informal; plain, spotted, foulard, striped, checked, paisley, large patterns etc. but I have a question; why is it that in many circumstances a foulard looks more compatible with a formal suit than say a plain tie? Is this purely a European taste (as Obama/US businessmen nearly always wears plain colours). Is it that plain ties often look ather dull against a formal worsted background. Would you add style as the fifth element – I ask as spotted ties were popular in the 80’s – less so now vs. plain & foulard- so though more formal less fashionable. It’s a good point. Small, discrete spots or geometric patterns can sometimes look more formal than plains. But it’s often the fact that such small patterns are printed silks – the most formal end of my texture spectrum. I do wonder, though, where a man should look if he doesnt want to spend £100 on a tie? Drakes, Hermes and the such are lovely but where would you go if you wanted to spend less than that, but better than a natty CT number? VM have added a number of “true” 7-folds over the last few days (the forest green one is particularly fine for formal business-wear). Shibumi also have a small number of formal “truel 7-folds, although also intriguingly at the other end of the spectrum, a 7-fold shantung grenadine….. This post gave me the very satisfying sense that as a regular PS reader, somehow I have learned this already. I love these parameters of formality. Are they all equal? My sense is that colour and pattern are baseline parameters that directly respond to occasion and setting, whereas tone and texture are, in a way, secondary variations that allow for some dandification. The latter two are are less easily picked up by the uninitiated (knit ties apart perhaps, but they also have an unusual shape). Good point Richard, yes I’d say those are slightly more important, but the others are easily ignored and shouldn’t be. PS academy! … There is the next books title! Thank you so much for this very very useful post! I think I was among those who wished such a post. Expectedly, this will help me to overhaul my tiny collection of ties! I’ve already read this post three times, and it’s still not enough! I Wonder whether it’s not entirely premised on an understanding of occasion and time that has remained implicit in your explaination. Hence for all those, like myself, who still struggle to grasp the inner logic of this post, perhaps really worth considering would be then one, hopefully in the near future, dedicaded to that damn notion of occasion, whose sense according to Bruce Boyer has been indeed lost. Last but not least, relying exclusively on their looks, how would you scale up the 5 ties displayed in The Merchant Fox’ ad? Thanks again for this post, Simon! The journey continues! Have a look at Michelsons website. Their ties are stupidly cheap for the quality. Eventually, I do realize that one part of my previous comment or rather question (about scaling the ties in the ad) was squarely irrelevant, for “deciding whether two ties with widely different readings on these scales is largely pointless”!!! While rereading your post it dawned on me that I happen to have a vintage woven silk tie (with a light blue as background and dark navy small geometric patterns) made by Pierre Cardin (Modèle deposé) , which surprisingly enough I have never ever worn with brown shoes, and yet with no rule or whatever other than merely esthetic reason in mind. Hence this new question: the case of satin ties aside, I guess, is there any relation between smartness of ties and shoes color? It’s a bit off topic, but I hope it could make sense in this context that sounds to me highly analytical! Only in the way that they are all linked through formality John. And perhaps the colour and tone are particularly relevant when considering the colour of other things you are wearing. Specific I know but what about a plain navy repp tie, with hand-rolled edges, with a grey herringbone tweed sportscoat? Both current season Drake’s. I think I quite like the contrast. Should be fine. The jacket is darker than it could be, which is nice, but the slightly rougher wool and patch pockets etc make it rather casual. I would include width and shape as well. A 7cm tie looks more informal than a 8.5cm tie. And a straight shape 8cm tie looks more informal than a half bottle 8cm tie. Though everything is related somehow. You would not make a foulard tie in 6cm width, or a knitted cotton tie in 9cm. Just as you would not wear a 9cm tie with a less formal slim suit. Another great article, anything with a diagram is a winner for me! I love ties they seem to be the one areas of menswear that allows the wearer to demonstrate some personality, without enduring office wide ridicule! The problem I find is that my tie collection is never big enough, plain and patterned/printed ties in several colours in 3 or 4 textures ends up as a pretty big number. While Drakes have done and continue to do some great business from me, I do wonder if you could do an article on the 5 or 10 most useful ties? I know you are a big fan of the navy grenadine and as the owner of a finca, a grossa and a donegal style grossa I agree, but how can I avoid owning 50+ ties? Hey Simon, as probably many guys I almost exclusively own printed Silk ties (mostly Hermes) and some woven silk (mostly Brioni, no “complex” weaves but rather larger woven in patterns). I wear those almost daily in the office. Now reading your site and browsing a bit through shops I didn’t know existed before I’d like to expand into different materials. I bought a woven brown wool/silk mix with a herringbone pattern as well as a simple navy grenadine tie, however I find it a bit difficult to make sense of the different weaves/materials against each other. For example woven wool and cashmere looks almost identical to me as does less irregular shantung silk. Tussah appears to be much more rustic and probably office-incompatible. Finally knitted-silk looks somewhat comparable to grenadine, but probably is not. The interesting thing is that for example Drake’s does *not* produce them in England, but instead explicitly mentions German and Suisse craftsmanship. Do you happen to know who does them from Drake’s? Could you give some pointers? Which combinations would you avoid? Which could go well? What construction would you recommend for a plain navy grenadine tie Simon? Would a 6 fold lightly lined work? It could do nicely, yes. Personally, I tend to wear a simple three fold. I care less these days for the intricacies of the make behind the tie. I’m looking for a tie to go with a green Donegal jacket. I’ve seen a particularly nice one at Drakes, a burnt orange tussah. Do you think the texture of tussah is too similar to the Donegal tweed to work? Brilliant, thanks. Is grenadine too formal for a Donegal jacket? I’m looking to build up my tie collection and have a number of questions. For heavier materials such as tweed, should I be going for a 6 or 7 fold tie as oppose to 3 fold? I’m guessing the tie will appear heavier and sturdier with more folds?? I think flimsiness with a tweed jacket will look silly. Also what’s the benefit of untipped ties? It’s a minor point, and I wouldn’t worry too much about it. Better to focus on colour and texture. Simon, lovely post, but I have a conundrum having thought it all through. In your view, would a simple smooth or smoothly woven (light pattern) matte cream silk tie be considered to be towards the formal end of the spectrum? Despite your comprehensive guide, with which I agree almost 100%, imagining this tie places it high on the formality spectrum for me (e. g. office with a fairly conservative suit-tie requirement. What are your thoughts? One of my favourites to wear in humid singapore. I sometimes try to dress it up for formal events (wedding), with high waisted grey pants, but am struggling, particularly to match it with neckties I own, given the shade of blue the jacket is. Would a white shirt and black grenadine work? What other shirt/tie colour combination would also work? Navy should be ok, still a decent contrast against the mid-blue, and also brown (as per the scarf in the picture). Can you please post a “how to” on how you tie your tie? It always looks great in photos, much better than my average execution. Thank you. What about satin ties with stripes? Would you wear these with a sport coat/button-down collar, or do they go better with suits? I took a photo of my striped ties ( https://i.imgur.com/mBV9KvW.jpg ). 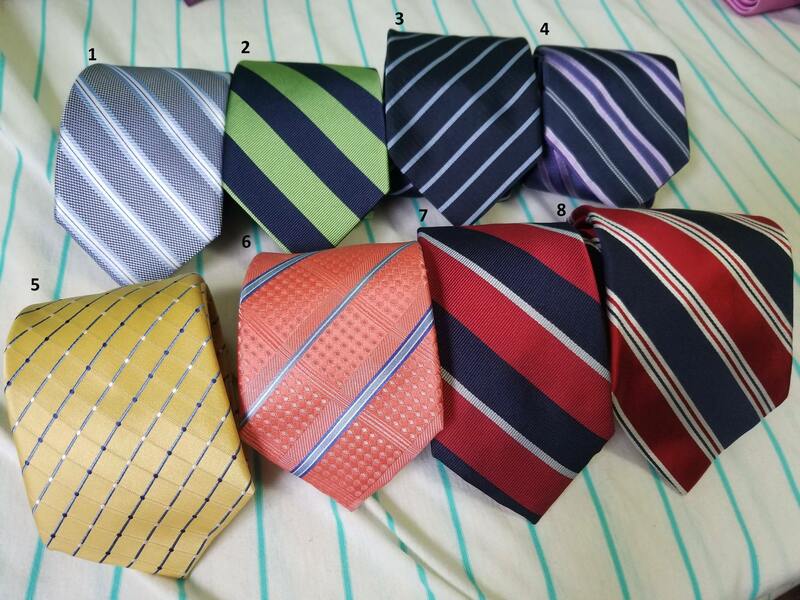 4 and 8 are the satin striped ties in question. I’m also not sure what I think of 5 or 6 either, if you don’t mind (formality level, sport coat vs suit). Were on the scale would you place a tie made in worsted wool? To me it feels smarter than say a woollen tie or one made in Donegal style. Would it still be a 6. or would it place higher?